It's all about bright colour these days! To help inspire you to start having an awesome summer. 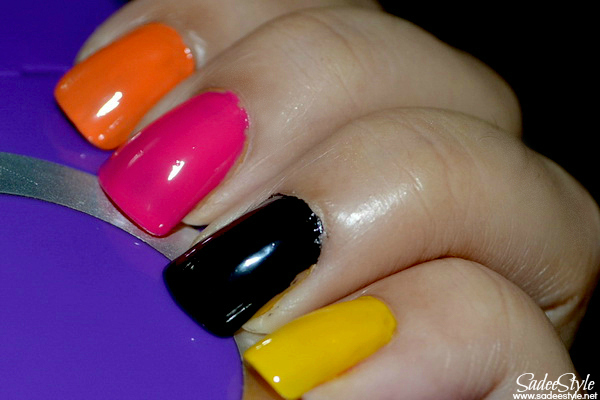 I am bringing you some colourful nail polish collection. Shiny and bright colours inspire and amaze me. As summers are always lazy and hot. I really wanted to make a very colourful post to make frustrated and dull mode bright. Today! 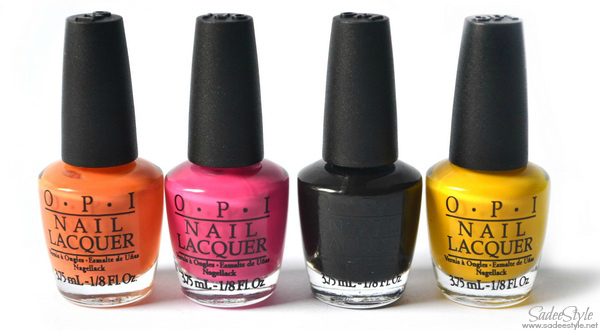 I have a beautiful summer NOTD for you with my all time favourite brand on nail polish brand OPI. 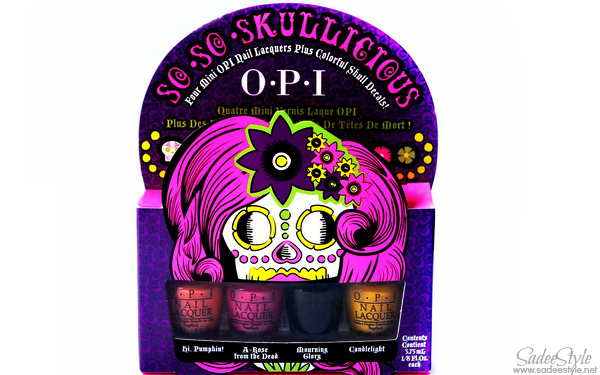 I grabbed a pack of OPI So So Skullicious Mini Nail Lacquers from Daraz.pk, which released back in 2012 as a Halloween edition. Since this year we are going to celebrate Eid in very hot season so I will be doing something special to make Eid even more delightful. 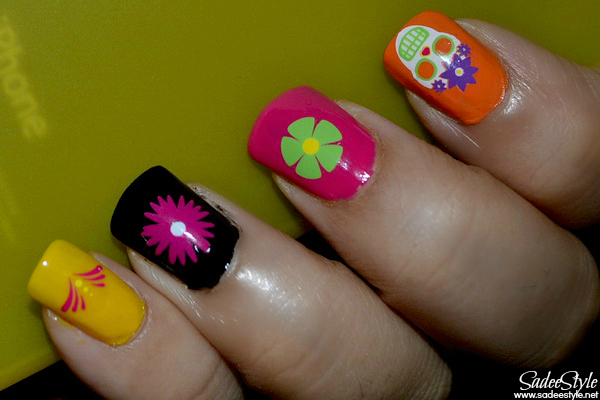 Ten Dia de los Muertos themed sugar skull decals. Opi A rose from dead Nail Lacquers. Opi Mourning glory Nail Lacquers. Opi Candle light Nail Lacquers . I appreciate the colourful packaging. The So So Skullicious set consists of a water decal sheet of ten wonderful stickers. It's a pure orange colour, very suitable for Halloween. The formula is a bit tacky and leave streaks. I need three coats to get an opaque finish, but surprisingly dries to smooth and glossy finish. A very bright and saturated pink nail lacquer. Its funky, shiny and very beautiful. It really does'n go with halloweed theme, but it's no doubt very feminine colour and quite better in formula. It needed only two coats to get it finish. A normal black colour with great shine and finish. It's good in formula and given the perfect finish just in two coats. It's a bright and sunny yellow colour. I always wanted to have a yellow nail polish to make a honeybee NOTD. I believe it's a perfect yellow to make honey bee look. Though it's very sheer and kind of watery. I needed around four coats to even it all out. I'm an opi sucker and want to have every single colour of opi. Although I like whole collection, but what I feel is that they should have included the green instead of black. Honestly it's very hard to deal with minis and work with small brushes, but I'm so in love with colours. They included the water decal into a pack. There is an instruction in pack to use these water decal. I love these decal these are very easy to use. 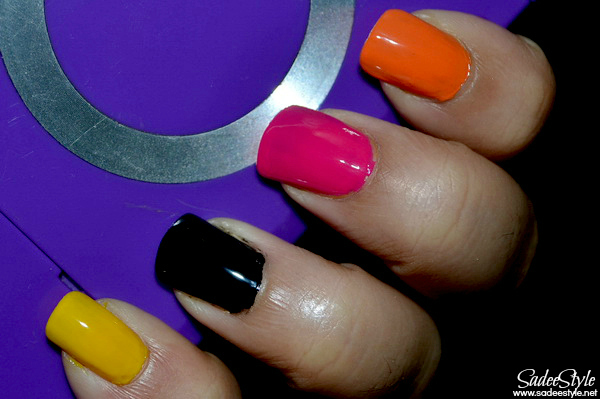 Some colours were opaque just in two coats when yellow needed around four coats to get it done. Very bright and pretty colour collection. All nail colour dries on glossier side. Love the water decal came with the pack..
Hard to work with minis because brush strikes too much. Formula of Opi pumpkin is streaky. Formula of Candle light is sheer. I'm so in love with this pretty pack and would highly recommend it!!! You got amazing nails girl!!! I love all these polished they are amazing! !